This first half of the second season of The Walking Dead ends with a great TV moment which shows everything The Walking Dead can be when it’s at its best. The barn full of zombies, which has been revealed to us a couple of episodes ago, and to the whole crew more recently, is opened up by Shane. Dramatically, the zombies are shot one by one by everyone except Rick, until, last out, comes zombie Sophia, wearing the same clothes she was wearing when she got lost. 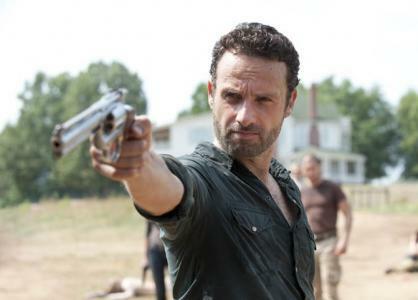 Everyone is stunned, too stunned to react, and finally Rick steps up and shoots her, taking on his leadership role and showing he’s willing to play rough at the same time. Even though I hadn’t cared so much about Sophia before, the way she came out out of the barn as a zombie had an immediate visceral emotional impact, and the misdirection of the barn plot had me forgetting about the search for Sophia temporarily. The scene was extremely powerful and exhibited surprise, plot development and characterization all at once. The Walking Dead is a show which with a short season and a half behind it is still trying to find its footing. It’s a good show, and it shows flashes of being a great show, but there are several areas that need improvement. There are two top-notch moments in the first half of the current season. The second is the barn scene that ends the half-season, leaving a very good impression going into the second half. The first is when Shane is shown in flashback shooting poor helpful redneck Otis to get out of the school with the hospital supplies alive. Both of these moments were character defining, hold your breath, call your friends and talk about them immediately after they happen moments. Not all of The Walking Dead can be like this – no show can have moments like this constantly and be sustainable. Still, the payoff of these scenes remind me how good the show can be. Characterization and pacing are probably the two biggest areas of The Walking Dead that need work. The Walking Dead has a lot of work to do buidings its characters up. The best developed character so far in the show is Shane, who began as the best friend who looked after Rick’s family before Rick met up with them, and who has slowly emerged as the primary antagonist in the show. His journey to antagonist has seemed fairly natural as he’s struggled with losing Laurie and dealing with Rick’s less practical, more soft leadership style. The rest of the cast either hasn’t gotten a chance to grow or have had their moments in stops and starts. Daryl, the redneck with the heart of gold, had one half an episode in which he has some battle with a hallucinated version with his brother, and other than that it’s not exactly clear what his deal is, or why he’s so friendly when he seemed more hostile in the first season (think Sawyer from Lost, but skipping past a few seasons). The Walking Dead needs to decide what its relationship with its own status quo is. Some shows constantly change while others like Battlestar Galactica feel uncomfortable once they venture too far from their original set up and work on getting back to it. I’m not sure whether I can expect constant change in The Walking Dead universe or whether even when they move from place to place as seems inevitable, they’ll just settle back into their routines. One way is not necessarily better than the other, but it affects the pacing of the show. In the first season, the characters moved around a lot and the plot almost felt rushed. Another episode at the camp might have let us learn about the characters more and laid down the groundwork for future conflicts. The second season, on the other hand, has remained at the farm and it feels like an episode or two could have been cut. All that time could have been used for productive characterization, but it wasn’t. Often, instead of organically feeling like a character got to a particular state, it felt like he got there because the story needed him there. An example of this is Dale’s admonishments of Shane in the last two episodes. For Shane, the journey to antagonist actually seems natural as I mentioned before. For Dale to hate Shane though, seems to come out of nowhere along with his certainty that Shane killed Otis. There were no scenes showing us why Dale would feel this way or why he would suspect Shane, connecting the dots. There’s three main story reasons to kill characters in this show that I can think of offhand. First, to provide a powerful emotional moment for the viewer. For this, there needs to be a lot invested in the dying character. Second, to show a big moment for another character. For example, Shane killing Otis. We don’t care that much about Otis, but it’s a powerful moment for Shane. Third, to show how dangerous an enemy is, such as the zombies. This is the main motivation between killing many of the early first season characters. This is a horrible world and the zombies are deadly. I have no way of knowing, but this seems like the type of show that’s going to want to kill off characters as it goes forward and right now I feel like for a majority of the characters I wouldn’t feel that much if they died (think Boon from Lost). There’s plenty of time to change this, but it’s something the show should be working on so they can give us more moments like the final scene in the last episode. I’m by no means souring on The Walking Dead. It’s just frustrating to watch a show that has so much potential not yet fill it. Unlike shows like Heroes and Lost that had me extremely excited only to lose me for good after I was quickly disenchanted, The Walking Dead has me right now thinking it has the same chance of being great as it did when it started. There hasn’t been any creative decision which is such a mistake that they can’t turn back from it and I have no reason to think there will be. The pieces remain in place, they’re just shifting back and forth waiting for someone to get the configuration right. I know what you mean about the pacing. I missed an episode and the recap didn’t have anything substantial in it when I read it online. I missed a whole week but didn’t functionally miss any more than Laurie crying a bit. Its good though and in a sense I am happy it moves like that so I know I can miss a week yet not get lost on plot or anything. One certainly can’t miss an episode of the wire and say the same thing. Great closing scene. The seoasn was very solid. Occasionally very moving. Sometimes the budget frustrated due to the lack of big ie ‘crowd/battle’ scenes but overall they did a really good job. Very few missteps. The showrunners did an excellent job of pulling the most salient moments from the book. The casting has been excellent, especially the children. And yes those dragons were way cool! er smoking hot I mean. Great reviews for GOT! Thanks Dennis, Roth et al. Can’t wait for the second seoasn so I’m off to read the second book now.